I am grateful for the photographic skills of young Mount Barker resident Lyndall Zobel of unpretended photography in this series of posts. Where we live and play! From the lower reaches of Australia’s longest river, the meandering Murray, near where it flows into the vast Lake Alexandrina at the Murray mouth, one can see prominent on the Adelaide Hills horizon, the diminutive Mount Barker peak, named after its white discoverer Captain Collet Barker who lost his life exploring the region in 1831. Only 360 metres in elevation it still dominates the landscape west of the highest peak, Mount Lofty, as the terrain gently slopes towards the Murray plains. It marks the site of one of South Australia’s oldest settlements, the Mount Barker Township, surveyed in 1839, with farmers starting to settle the undulating countryside in 1844. Now with a population of about 15,000 it is the urban hub of the Hills, close to the tourist meccas of Hahndorf, and Strathalbyn, and merging with the adjacent growth centres of Littlehampton and Nairne. 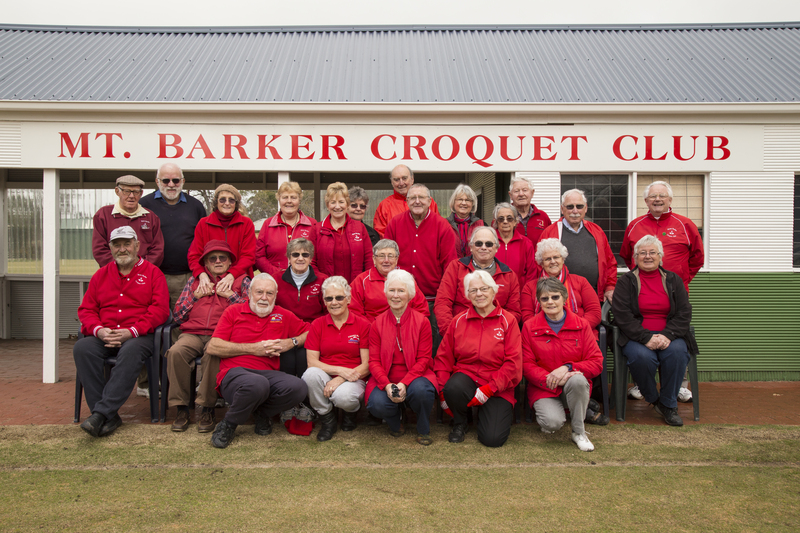 The Mount Barker Croquet Club is on the fringe of the shopping district, next to the Bowling Club, and across the road from Stephenson Park. It is in a pleasant, relaxing setting with stately elder trees on either side of an adjacent pathway, and majestic gnarled massive red gums thriving in the creek bed to the south. Photinia shrubs provide a screen from passers-by walking the scenic trail to the Laratinga Wetlands. Should you have opportunity to visit this idyllic part Australia’s Southern State, why not think of paying a visit to our croquet club and meet us in person. Even if you have never played croquet before, you can still come and test your skill with mallet and ball in running the hoops, on a Thursday or Saturday morning for “golf croquet”. Fortunately it is possible to play croquet the year around in Australia, except for the days when there is pelting rain, or searing heat. Here is the club photograph for 2015, the year we celebrate 100 years of croquet played on our three Mann Street lawns. It is just those that play Golf Croquet. Absent are the few Association Croquet players. Did you ever see a more handsome sporting club than this vigorous group of 25? Back Row: William Kidd, John Freeman, Denise Fry, Mavis Klenke, Heather Daniels, Meredith Walters, Robert Armstrong, Kevin Jaensch, Peggy Louch, Joy Steer, Trevor Kramm, Ken Robson, John Selby (Vice President). Middle Row: Eric Klenke (Committee member), Peter Fry (Grounds person), Lorraine Kramm (Committee member), Valda Jaensch (President), Neal Gibson (Secretary), Patricia Schultz (Committee member), Wendy Thiele (Treasurer). Front Row: David Foster, Gloria Foster, Sandra Armstrong, Marjorie Turner, Lorna Gibson. John Selby addresses the ball. Continuing the forward swing after striking the ball. Safe now to look up. John Selby contemplates his next move. Red has a clear shot on the hoop! The black ball is played and blocks the red ball’s approach to the hoop. The red ball still has a chance to run the hoop with a jump shot! Peter Fry shows his grip with widely separated hands. Did the blue ball run the hoop? Our current Club President is one of our lady members, Valda Jaensch from nearby Callington, who first tried croquet on the 4th June 2005. 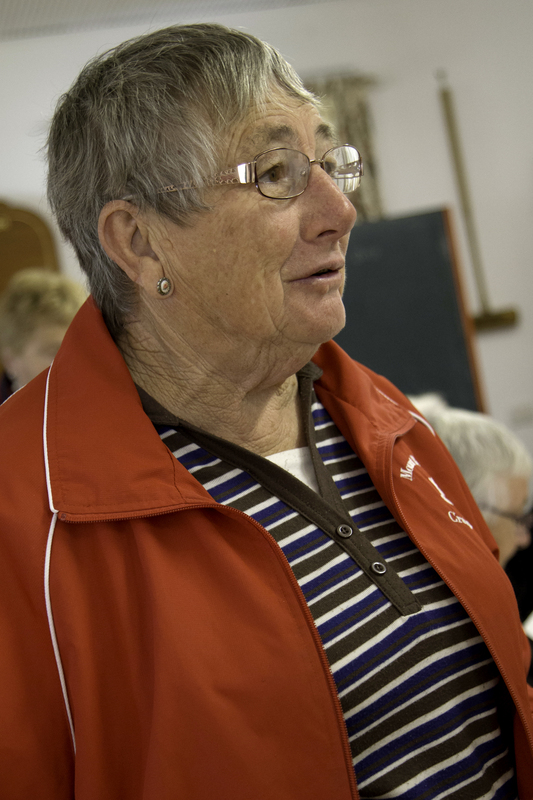 She so enjoyed it that she remembers the date precisely, and has played social croquet at Mount Barker ever since, together with participating in gala day competitions. Valda’s husband Kevin has shared his wife’s enjoyment of croquet from the same memorable occasion in 2005. Retired and in his late 70’s, croquet has been a perfect sporting interest for him, and an activity which he can share with Valda. When John Selby retired in March 2002 he chose golf croquet for his sporting activity. He is one of our outstanding players and has served the club well as coach and photographer. He is the Immediate Past President of the Club, and current Vice President. Croquet is a game that can be played to an advanced age, even into the nineties. Skills by then may be declining, but with age comes the “smarts”even to the point of a little more cunning when it comes to strategy. 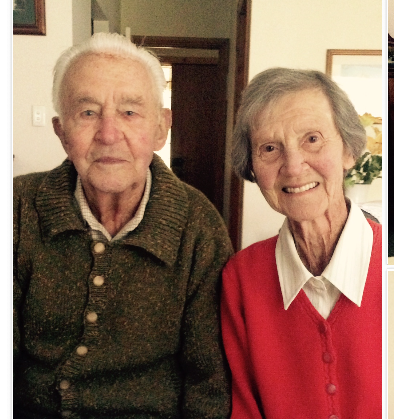 Heading our honour list would have to be now retired Bert and Bette Walkom. Bette took up golf croquet in 1963 after the trauma of an accident in the family. Bert followed on but preferred the more involved Association Croquet. He proved to be an excellent player achieving a handicap of only 3, and winning a tournament at Millicent in the South East of the State. Trevor Kramm is the only member to regularly play both forms of croquet, Golf and Association Croquet. There is merit in doing this. The games foster overlapping but slightly different strengths. The playing of one may help improve your skills for the other code. For example Trevor brings a confident running of the hoops from golf croquet to his Association game. 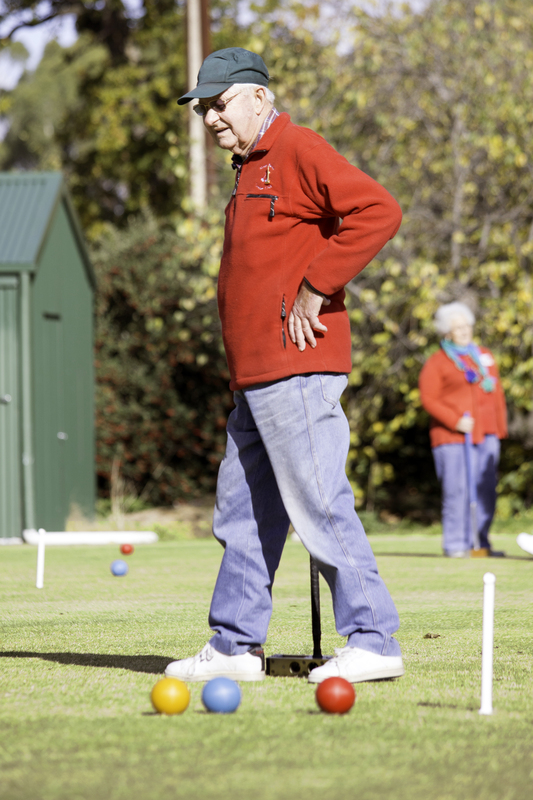 Although in his mid-eighties, Trevor’s skill from 13 years of croquet is little diminished, and he still very much enjoys not only the games, but the social contacts, and opportunities to meet new people. Wife Lorraine plays croquet too. 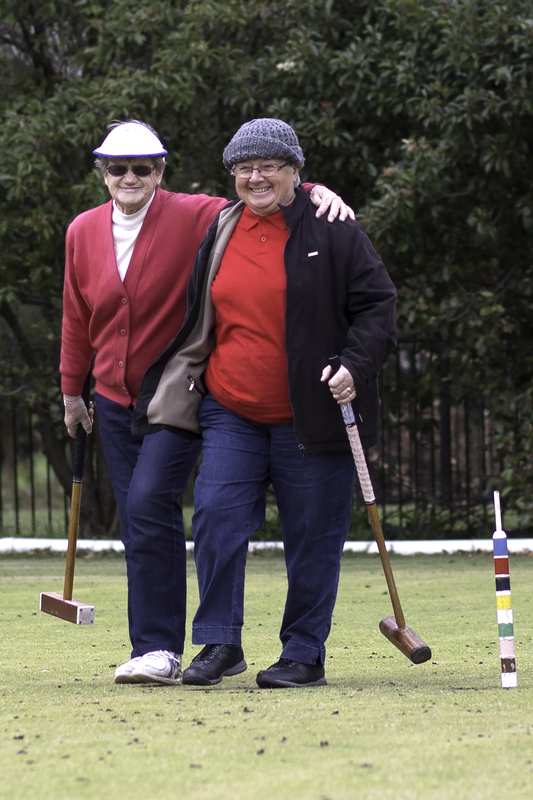 The Kramms are another of several couples to enjoy playing croquet together at this club.